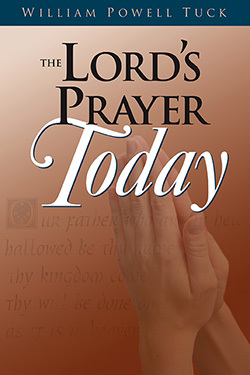 Few prayers are as familiar as the Lord’s Prayer. Every word and petition is filled with powerful images. For many, however, the constant repetition of the words have made the richness of this prayer grow dim. Repetition without understanding cannot be adequate. A reflective study of Jesus’ model prayer can help us to understand and follow more clearly the teaching of this prayer. Our familiarity with the Model Prayer sometimes costs us its impact. Prayer is seldom easy. It requires time, discipline, study, reflection and commitment when genuine spiritual growth is desired. By examining each petition of the Lord’s Prayer, William Powell Tuck hopes that we can move beyond the common rote of the prayer and explore the depths of its meaning for our daily lives. The phrases of the Lord’s Prayer move us to focus on the divine presence of God and remind us of our ultimate dependence on God and responsibility to others. This prayer helps us to see the inclusiveness of God and gets us beyond our desire to be exclusive. William Powell Tuck invites us all to take a spiritual journey down the pathway of the Lord’s Prayer. Waiting for us there will be a greater awareness of the rich meaning of prayer. William Powell Tuck is a pastor, speaker, and an author living in Lumberton, North Carolina. He is the author of seven books, including Getting Past the Pain. He is a native of Virginia and received degrees from the University of Richmond, New Orleans Baptist Theological Seminary, and Southeastern Baptist Theological Seminary. He has served churches in Kentucky, Virginia, and Louisiana. He and his wife, Emily, have two children.